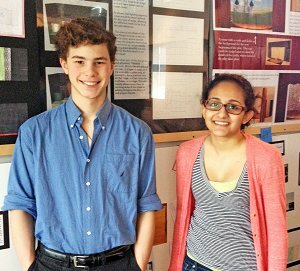 Twenty-one students represented NPHS at the TSA-NJ state conference and competition earlier this spring. The TSA (Technology Student Association) is a national organization that provides opportunities for students to compete and achieve recognition for their skills in integrating STEM (Science, Technology, Engineering, and Math). Competitions in over forty different events incorporate iSTEM skills, such as architectural design, web design, bridge-building, and video design. A NPHS junior won first place for a desktop publishing entry and will advance to the national competition. 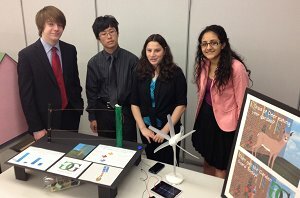 Five NPHS students competed in the annual Thomas Edison Design Challenge at NJIT in April, winning fourth place. 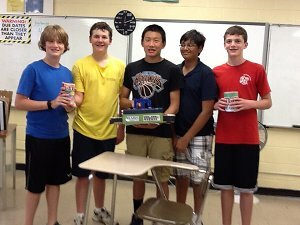 The New Providence team invented a solar-powered/wind turbine-powered device to keep deer out of gardens. The harmless, environmentally safe device utilized an invisible electric barrier to set off sounds to scare the deer. JCP&L provided solar panels and wind turbines to use in their innovation. Three students competed in the NJIT Dean of Architecture's annual design challenge. The challenge was to design an avant garde puppet theater for the play, “The Mask of the Red Death.” One NPHS student was awarded an honorable mention for his design. Have you ever felt you could improve the design packaging of your favorite food? The students in Geometry Theory and Applications course did exactly that during the month of June. 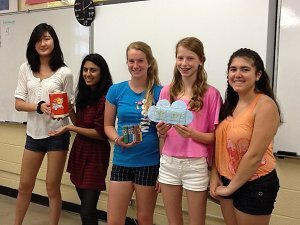 With the help of three-dimensional spatial relationships, volume and surface area formulas, and an introduction to product advertising and marketing, the students designed a new container for Mars M&M candies. They previewed “25 Stunning Package Design Ideas” on the web and then created unique containers for regular-sized M&M's and mini M&M's. Finalized designs were fashioned from composites of truncated cones, square pyramids, cylinders, and prisms, and included pouring spouts, categorized compartments, and even jumbo family/party packs.